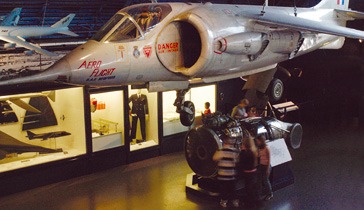 The Flight gallery is brimming over with extraordinary exhibits reflecting both British and international achievements in aviation. From the flight dreams of the Renaissance through to the jump-jet and the wide-body aeroplanes of today, you’ll find them all in the Flight gallery. Aircraft on show include many from the pioneer days of aviation, such as the most authentic Antoinette monoplane (1909) to be seen anywhere in the world. Other exhibits include the Supermarine S6B racing seaplane, the Hawker P1127 – which led to the Harrier jump-jet fighter – and a complete slice of a genuine Boeing 747 jumbo jet! Alongside the full-size aircraft you’ll find more than 100 aircraft models and a host of commemorative exhibits associated with pioneer balloon flight. The gallery is also home to a unique collection of more than 80 significant aero engines, ranging from one which powered the first British airship in 1907 through to a Rolls-Royce RB 211 – the parent of the huge fan-jets that power today’s airliners.